With the sun beaming down in the Town of Mount Royal, the Club de Soccer Mont-Royal Outremont Griffons bagged three points in their home opener. After falling to FC Gatineau in their first game of the season, CS MRO bounced back on Sunday night, scoring three goals against CS St-Hubert. With a trio of goals on the scoreboard, it was the Griffons defence who starred on both ends of the field. CS MRO’s defence suffered pressure while also contributing on the offensive side. 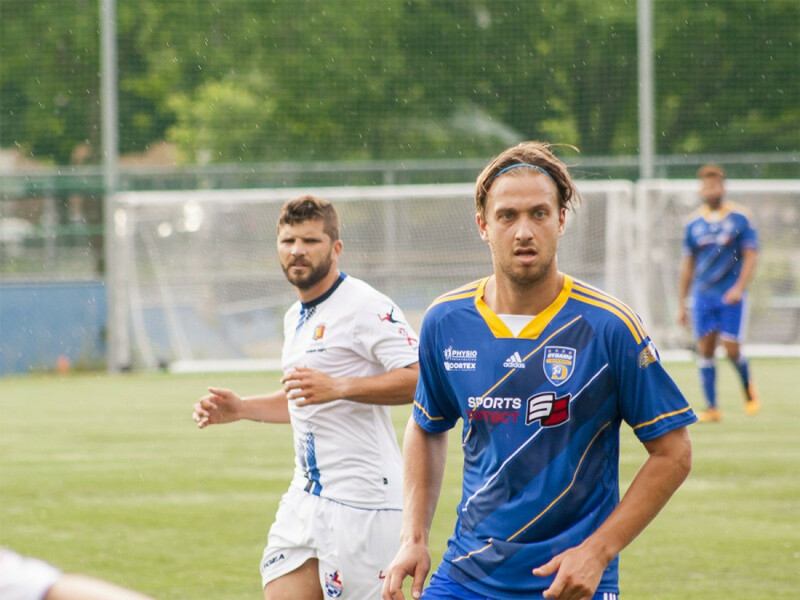 Defender Louis Philippe Campagna scored two goals, while midfielder Renan Dias added one to his name. The first half saw both sides having difficulty developing chances on goal. New signing, defender Julien Obriot, was the primary outlet for the Griffons moving forward on the left side of the field. While the France native was taking care of his defensive duties, Obriot’s speed and ball control proved difficult to handle for the visitors. With less than ten minutes left in the first half, CS MRO opened the scoring after a free kick from Billal Qsiyer found the head of Campagna. The ball tipped off the defenders head and into the bottom right corner. As the game progressed, CS MRO continued to win crucial tackles and began to put more pressure on the opposition, making it difficult for St-Hubert to control the ball. At the 65th minute, matters became more difficulting for the visiting side, as St-Hubert’s Matthew Francois was given a red card for a slide tackle on Jean-Pierre. Francois was ejected from the game, leaving St-Hubert to finish the match with ten players. Two minutes later the Griffons would double the lead through Dias, as his header saw the back of the net. The Griffons eventually sealed the game after Jean-Pierre intercepted the ball in the St-Hubert box laying it off to Campagna. Standing patiently in front of goal, the defender redirected the pass into the net to cement the victory. CS MRO will look to get another win under their belt this Saturday as they pay visit to Dynamo de Québec.